50, is constructed from support beams from the outdoor columns of the La Veta Hotel. This display building houses clothing, hats and shoes. It also includes a Campfire Girls ceremonial dress. This building was Colin Moore’s Plumbing Supply Storeroom. Colin Moore worked at the Aberdeen Granite Quarry and the Denver South Park & Pacific Railroad. 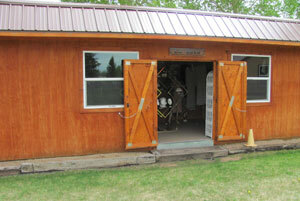 The cabin is approximately 100 years old. 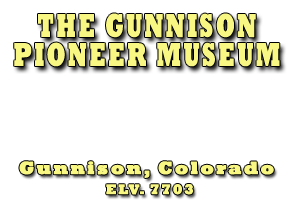 Originally located at 210 South Taylor Street in Gunnison (“210” is still on the building), it was moved to the Moore land west of Gunnison. 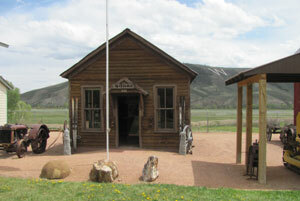 Tom Redden donated the cabin to the Pioneer Museum in 2003. 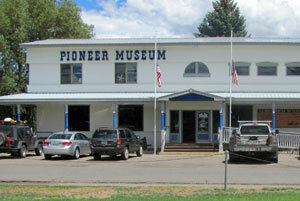 The building contains an eclectic blend of memorabilia including radios, sewing machines, artist supplies, military posters, salt and pepper shakers, an old washing machine and a clock from the Miller Furniture Store from the late 1920s.